Last season Jojo Cruz came out of retirement to take the fashion world by storm. With the help of her daughter Rosalind, Jojo used her impeccable eye for matching outfits to brighten runways around the world. Now Jojo and Rosalind have great expectations they must meet as they launch their joint line Las Cruces. Unfortunately, Katrine Yue, the new editor at Fashion Wear Daily, has strong opinions about what constitutes elegance and it doesn´t always match the Cruz vision. She´s assigned her star photographer Avett to cover all of the Cruz shows. 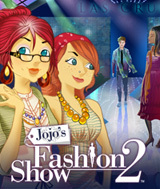 Can Jojo and Rosalind continue working together in the face of new challenges including designing for men? Is one label big enough for two strong women? Make stylish outfits from cute tops, elegant dresses and stunning heels as you showcase your fashion sense on runways around the world. Then capture the looks in the brand new fashion photo shoots mode. Thousands of stylish outfits and accessories for women and men. Dozens of clothing styles from Sockhop to Prom to Bollywood. 50 action puzzle levels- match styles and find hot signature outfits from different clothing mixes. 25 action seek & find levels- take photos of stylish outfits that match specific styles. Create, save and export your favorite outfits in Dress-Up Mode. Comments: If you like the first then you should enjoy the second. Some other side games added to add in the fun. Comments: I loved the first Jojo's fashion show and couldn't wait for the follow up. Well it was worth the wait, this game rocks. They took everything we all loved about the first game and added a few new twists like the seek and find boards. This is a great game for moms to play with their daughters. The first time we played it we were laughing and screaming the whole time. I can honestly recommend this game to anyone, it's that great of a game.